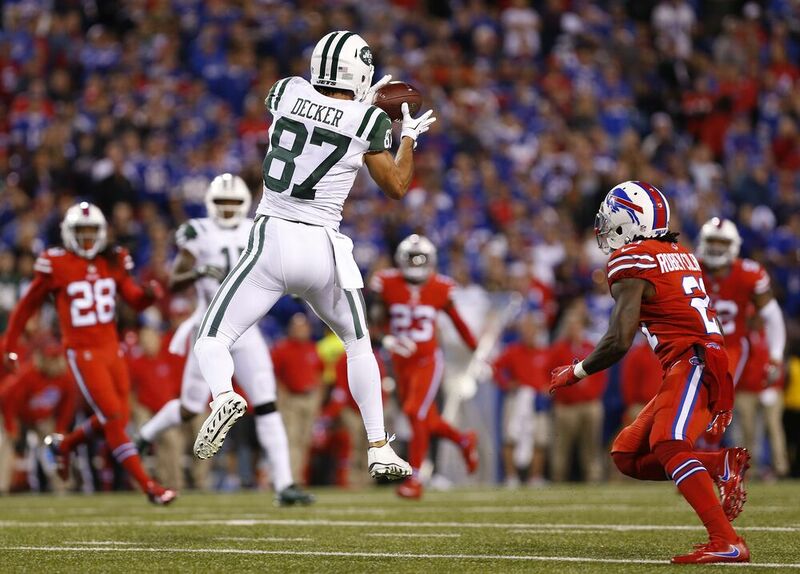 The New York Jets are reportedly set to cut ties with Eric Decker after three seasons. The New York Jets will apparently trade or release wide receiver Erick Decker this week. ESPN’s Adam Schefter tweeted out the news and also reported that the Jets have informed Decker of their decision. The 30-year-old Decker spent the last three seasons with Gang Green and signed a five-year, $36.25 million deal with the team prior to 2014. He was hampered by a shoulder injury last year and had just nine catches for 194 yards and two touchdowns. It was his lowest total since his rookie year with the Denver Broncos back in 2010. In total, Decker posted 163 catches for 2,183 yards and 19 touchdowns in his three seasons with the Jets. This is quite the interesting move on the Jets’ part. New York is coming off of a 5-11 season and has not had a playoff appearance since 2010. With Decker gone and Brandon Marshall having signed with the New York Giants, third-year player Quincy Enunwa figures to be the offense’s top receiver. Enunwa posted 857 yards with four touchdowns last season but has little help behind him. That means the 2017 season could wind up being another long one for the Jets and their long-suffering fans. The good news is that Decker is still young enough that another receiver-needy team could be willing to pay a small price for him. So long as his shoulder is healthy, he is capable of putting up strong numbers for another squad. After all, he did post a pair of 1,000 yard seasons with Geno Smith, Michael Vick and Ryan Fitzpatrick throwing him the ball, so it really wouldn’t matter who his quarterback was. This is purely a salary move on the part of the Jets, so here’s hoping GM Mike Maccagnan can at least get something in exchange for Decker.